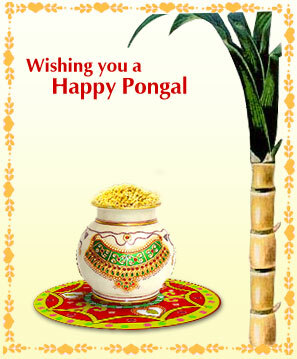 Pongal is the harvest festival of the Tamils. After the tamil month – Maargazhi, comes Thai (not pronounced as in Thailand. Pronounced as in thigh). It marks the end of the harvest season. According to the tamil seasons – the month of Thai falls in Mun Pani Kaalam – early winter. Pongal cannot be considered a religious festival, though it is more popularized as a Hindu Festival. It can be called as a thanks giving celebration – the farmers thank the Sun God for a bounty harvest and thank their cows for their milk and the bulls who helped them plough their fields and pull their carts. People living in cities are not really connected to this professional affair. With much population moving towards towns and cities for non-agriculture based livelihoods, what keeps the tradition still alive? The quintessential grain of the people of south india – ‘Rice’ is needed for making Idli, Dosai, Cooked Rice, Payasams, Savouries and many more food items. Might be this connection between those farmers and city dwellers keeps everyone celebrate pongal alike. When the farmers thank their cattle and nature for helping in their bountiful harvest, people in other parts celebrate Pongal as a thanks giving festival to the Farmers who provide them with the incomparable and unsubstitutable RICE, other crops and vegetables. Pongal is a four-day affair. 1. The first day – the last day of the month of Maargazhi – this year (2012) January 14 – is called Bhogi Pongal and is the day of cleaning. All old unwanted things are shed away. 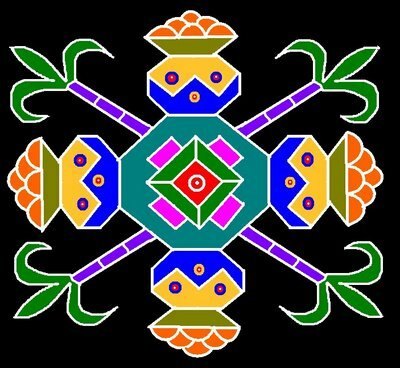 People white wash their houses and new Kolams – traditional drawings on the floor with rice flour and the house gets ready to celebrate Pongal the next day. ‘Thai pirandhal vazhi pirakkum’ – meaning when the month of Thai is born, good things start coming into everyone’s life. Pongal is also called Thai Thirunal and Thamizhar Thirunal – which means the festival of the Tamils – beyond religions. Pongal means boiling or spilling over in reference to rice or milk. It is celebrated in cities on the gas stoves in the kitchen. In villages and towns, mud stoves or brick stoves are used to cook the newly harvested rice on man chatti/earthen pots or vengala paanai/brass pot. The stove is kept on the traditional kolams drawn on bogi night and pongal – plain rice and sweet jaggery rice is cooked not in the kitchen but in front of every house – thanking the Sun God. The Vengala Paanai used only for Pongal purpose, is also called the ‘Ponga paanai’ is given to every bride by her parents and the first pongal after marriage is called ‘Thalai Pongal’ and the new daughter-in-law celebrates Pongal with her new Ponga paanai. After a few years of usage, unfortunately now, mine lies back home and so I use the normal pressure cooker in kitchen to make Pongal. There would be two Paanais/vessels. One with plain white rice and water and the other with plain white rice and when it boils, jaggery is added to make Sarkkarai Pongal – the sweet jaggery rice – the delicacy associated with the festival. When the new rice boils and spills over the paanai, women of the house say – ‘Pongalo Pongal’ in chorus. Maavilai thoranam/decorating houses with fresh mango leaves, Manjal Kizhangu/Fresh turmeric with the fresh leaves tied to the Pongal Paanai, Karumbu/Sugarcane and Panankizhangu/Palm Root are certain things associated with Pongal and those which I miss a lot during these special days, not to mention the fresh Banana leaves. Not only Sarkkarai Pongal, the whole feast meal consists of those traditional vegetables – the normal four coarse meal – ilai saapadu – is enjoyed by the whole family. Sambar, Rasam and Yoghurt being normal, Avial – a vegetable dish with coconut gravy – using raw banana, egg-plant, pumpkin, drum sticks and many other root vegetables is the highlight of the day. By the end of the day, the tongue would have lost its taste co-ordination due to the unlimited intake of sugarcane! The strong and courageous use their strong teeth to peel the skin of sugarcane – enjoying the real taste of course. The more pampered ones like appa – my father – would have their share of sugarcane cut to bit size pieces by his mother – aachi . The sight of my then sixty-five to seventy year old aachi sitting down on the floor with her arivalmanai – colloquially aruvamanai – the all in all traditional metal knife with a base – which cuts, chops and grates coconuts, and cutting sugar cane for appa is still framed in my mind. Even now, she is ready for it, but we don’t let her do it! 3. The third day is Maatu Pongal – the day to thank the cattle. When in Thoothukudi in my maternal grandparent’s home, since there were cows, maatu pongal would be a colorful affair. Mamas/Uncles would paint the horns of cows and calves in different colours and we youngsters would tie colorful flower garlands to their necks. Thaatha would bring the bullock cart from his farm – and when we were very young, would even taken a ride in the bullock cart. That diminished later, and only painting horns and worshipping them continued till there were cows at home. This day is also famous for Manju Virattu or Jallikattu – the bull fight – the tradition that is regarded to be more than 2000 years. In ancient days, parents of a girl would give their daughter to a courageous man who tamed the bull. 4. The fourth day is Kaanum Pongal. It is the day of meet and greet. People visit their relatives and friends on this day. This is also a day of family picnic with ‘kootanchoru’ – the mixed rice packed by aachis and ammas for everyone for lunch. My maternal grandfather – thatha would drive us – the grandchildren – to River Thamiraparani in Vallanadu in Tuticorin district. We would swim in those cold waters – or literally warm water – nearly for three to four hours enjoying kaanum pongal picnic. Thatha made it a thatha and peran/pethigal – Grandfather-grand children day. When we were older, thatha took us again – just to see the water which had turned ankle depth – that made us really sad. Now for the true essence of Pongal, Sarkkarai Pongal! For those with no sweet tooth or less sweet preference, but like to taste pongal – might try this one – have the sweet pongal with some sambar or coconut chutney. 5. January 16 of every year is also celebrated as Thiruvalluvar Naal/Thiruvalluvar Day. Thiruvalluvar is the author of Thirukkural. This would give a clear picture of the man and his contribution to Tamil Literary Works. Thirukkural was written by Thiruvalluvar, who is believed to have born 30 years before Jesus Christ. The Tamil Calendar is dated from that period and referred as Thiruvalluvar Aandu (Year). We find Thiruvalluvar as a moral philosopher, political scientist and master of public administration in the first two parts of Thirukkural. We find him to be a creative artist in the third part, depicting the fascinating aspects of lovers. Thank you for posting the delicious sarkkarai pongal. Wish you and your family a happy Pongal. Thanks for your wishes. Happy Sankranthi wishes to you and your family! Did you make Nolen Gurer Payosh which is a sankranthi delicacy in bengal I read?